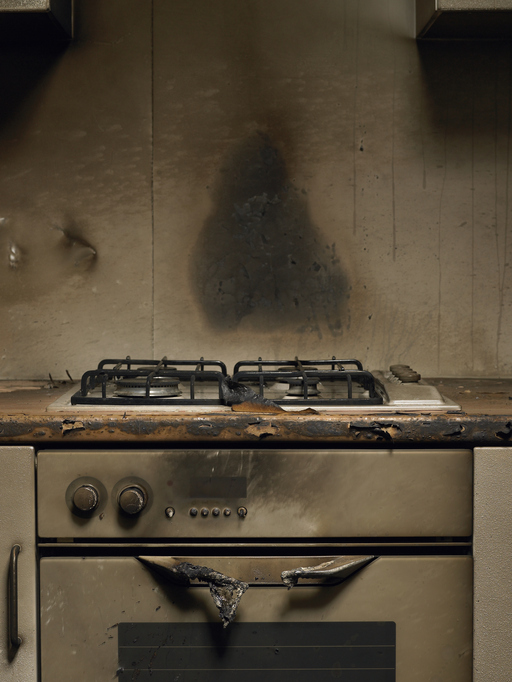 A fire is one of the most devastating accidents that can happen to your home. Fires produce byproducts that can damage your property while also exposing the home’s occupants to long-term health risks. One of the most common consequences of a fire is smoke odor. This odor will cling to a variety of surfaces and can linger in your home long after the fire has been extinguished. This odor compromises the air quality in the house and can be harmful to the health of the residents in the home. The type of material that burned or melted during the incident also plays a huge role in the type of smoke molecules that get dispersed throughout the building and in turn what types of removal processes to attack and remove them with. If your home is affected by smoke, it is crucial to rid your home of the soot residue and smoke molecules in a quick and effective manner to restore healthy air quality in your home. To remove these smoke particles from the house, you will need to use specialized cleaning equipment and lots of effort. While there are a few ways to reduce some odor in your home significantly, there are a variety of factors to consider ensuring your efforts will be enough to restore your home to a safe living condition. The factors include the size of the fire, the length of time the house was exposed to the smoke and the type of materials burned. Below we have put together a list of proven methods to help you remove the smoke odor from your home. The first thing to remember is that your safety comes first. Smoke particles, or soot, can become airborne while cleaning takes place. Wearing a dust mask to prevent breathing in the particles will help prevent your lungs from getting this acidic soot in them which could cause irritation. Wearing gloves is also important. Other than the obvious protecting your skin from the oily acidic soot this will also protect the items that you are touching. The oils from your skin when in contact with the oily soot can cause staining on the materials you are touching. Plastics, electronics, vinyl surfaces, upholstery and walls around light switches are some of the main surfaces we see get damaged by this contact. Open all windows and doors to allow for good ventilation and to let fresh air inside. You can increase airflow by removing all window screens. It is also recommended that you place fans throughout the home. The fans should be placed strategically, pointed at corners of the rooms or towards windows and doorways to help move the smoke odor out of the house. It is essential to keep in mind for cases where the smoke odor is overwhelming you may need to use a technique called positive pressure to help air out your home. To this you need to:To remove these smoke particles from the house, you will need to use specialized cleaning equipment and lots of effort. While there are a few ways to reduce some odor in your home significantly, there are a variety of factors to consider ensuring your efforts will be enough to restore your home to a safe living condition. The factors include the size of the fire, the length of time the house was exposed to the smoke and the type of materials burned. Set up a large fan facing inward, just outside of your open entrance door. Close all the other windows and doors in the home leaving only one window open for exhaust, allowing the fresh air to be forced into the home and any smoke or smoke odor that is still lingering to be blown out. Blow the area out for at least 15 minutes, then close the window and door, moving on to the next room and repeating the steps above until you have aired out every room in the home. For larger or more complex fires, longer periods of off-gasing will need to take place and can be utilized best by a trained Servicemaster of Greater Pittsburgh Technician. While it is crucial to introduce fresh air into your home to reduce the smoke odor, you must also clean all of you household items, materials, and surfaces affected by the smoke to completely remove the smell. To ensure you remove the smoke odor from your home, you will need to deep clean all surfaces and materials that encountered the smoke. Start the cleaning process by removing all curtains, furniture covers, area rugs, blankets, decorative pillows, and any other fabric materials in the home. Once removed, wash them or have them dry cleaned. You need to wash all clothes, towels, and linens that have been exposed to smoke as well. Once these items have been cleaned, keep them stored outside of your home until the smoke odor has been eliminated or you risk having these items soak up the smoke smell again. You should also use this same solution to clean all non-carpeted floors, rinsing the mop under running water after each run to prevent the smoke particles from contaminating the mop bucket and ending up back on the floor. For furniture, you may need to use specialized products to remove the odor. Be sure you purchase the proper products and follow the directions strictly. After cleaning, if weather permits, place the furniture outside to dry in the fresh air. Window panes will need to be cleaned to restore their shine and transparency, but it is essential to focus on the window sills, frames, screens, and the window blinds. The smoke particles are more likely to stick to these surfaces compared to the glass. To clean the window screens, place them a tub or washbasin, using dish soap to clean them. Be sure to rinse the screen thoroughly with cold water and leave them out in the fresh air to dry. If you have an exhaust fan, you can clean it using the same method. To clean the wooden window blinds, use a wood-friendly, specialized product and for plastic blinds, use a solution of hot water and white vinegar to remove the smoke smell. Baking soda has been shown to work effectively to remove the smoke odor from these materials. Sprinkle the baking soda on your carpets and upholstery and leave it to sit for several hours or the entire day to allow the baking soda to absorb the smoke odor. After the baking soda has had time to sit, vacuum the carpets and upholstery. It is essential to use a vacuum equipped with a HEPA filter to prevent the smoke particles from reentering the room. Another more effective method is steam cleaning. Be cautious when steam cleaning when it comes to delicate materials like wool carpets or leather. 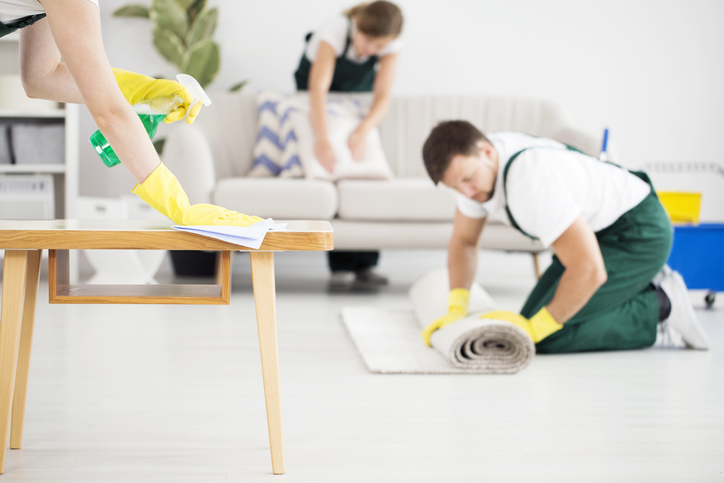 These types of materials could be damaged from steam cleaning, so to avoid ruining your upholstery or carpets, it is best to leave the job of steam cleaning to the experts at ServiceMaster of Greater Pittsburgh. The final step in ridding your home from the smoke odor, you will need to clean your HVAC system. Smoke can get into your ductwork and linger in your ventilation system, contributing to the low air quality in the home. You will need to replace the air conditioning filters, air filters, and furnace filters. It is also essential to have your HVAC inspected to makes sure it wasn’t damaged during the fire. You may require professional air duct cleaning to ensure good air quality in your living environment is restored. Do not attempt to clean items that are covered in soot. Utilize professional cleaning services to keep them from becoming damaged. Also, if the smell of smoke is still lingering, even after cleaning, you may need to replace the items or materials that have absorbed too much smoke odor. If you’ve taken the above steps and the smoke smell remains, it is time to call the professionals at ServiceMaster of Greater Pittsburgh who have the removal techniques and cleaning products to safely and efficiently remove the smoke odor from your home. Contact us today to learn more about our professional smoke odor removal services.